His reign is recognized for the extensive administrative, military, and fiscal reforms he instituted, which culminated in the Decree of Tanzimat ("reorganization") that was carried out by his sons Abdulmejid I and Abdülaziz. Often described as "Peter the Great of Turkey", Mahmud's reforms included the 1826 abolition of the conservative Janissary corps, which removed a major obstacle to his and his successors' reforms in the Empire. The reforms he instituted were characterized by political and social changes, which would eventually lead to the birth of the modern Turkish Republic. Notwithstanding his domestic reforms, Mahmud's reign was also marked by nationalist uprisings in Ottoman-ruled Serbia and Greece, leading to significant loss of territory for the Empire following the emergence of an independent Greek state. His mother was Nakşidil Valide Sultan. In 1808, Mahmud II's predecessor, and half-brother, Mustafa IV ordered his execution along with his cousin, the deposed Sultan Selim III, in order to defuse the rebellion. Selim III was killed, but Mahmud was safely kept hidden by his mother and was placed on the throne after the rebels deposed Mustafa IV. The leader of this rebellion, Alemdar Mustafa Pasha, later became Mahmud II's vizier. Western historians give Mahmud a poor reputation for simply being the Sultan during a time of deterioration of the Ottoman Empire. There are many stories surrounding the circumstances of his attempted murder. A version by the 19th-century Ottoman historian Ahmed Cevdet Pasha gives the following account: one of his slaves, a Georgian girl named Cevri, gathered ashes when she heard the commotion in the palace surrounding the murder of Selim III. When the assassins approached the harem chambers where Mahmud was staying, she was able to keep them away for a while by throwing ashes into their faces, temporarily blinding them. This allowed Mahmud to escape through a window and climb onto the roof of the harem. He apparently ran to the roof of the Third Court where other pages saw him and helped him come down with pieces of clothes that were quickly tied together as a ladder. By this time one of the leaders of the rebellion, Alemdar Mustafa Pasha arrived with his armed men, and upon seeing the dead body of Selim III proclaimed Mahmud as padishah. The slave girl Cevri Kalfa was awarded for her bravery and loyalty and appointed haznedar usta, the chief treasurer of the Imperial Harem, which was the second most important position in the hierarchy. A plain stone staircase at the Altınyol (Golden Way) of the Harem is called Staircase of Cevri (Jevri) Kalfa, since the events apparently happened around there and are associated with her. The vizier took the initiative in resuming reforms that had been terminated by the conservative coup of 1807 that had brought Mustafa IV to power. However, he was killed during a rebellion in 1808 and Mahmud II temporarily abandoned the reforms. Mahmud II's later reformation efforts would be much more successful. During the early years of Mahmud II's reign, his governor of Egypt Mehmet Ali Paşa successfully waged the Ottoman-Saudi War and reconquered the holy cities of Medina (1812) and Mecca (1813) from the First Saudi State. Abdullah bin Saud and the First Saudi State had barred Muslims from the Ottoman Empire from entering the holy shrines of Mecca and Medina; his followers also desecrated the tombs of Ali ibn Abi Talib, Hassan ibn Ali and Husayn ibn Ali. Abdullah bin Saud and his two followers were publicly beheaded for their crimes against holy cities and mosques. His reign also marked the first breakaway from the Ottoman Empire, with Greece gaining its independence following a revolution that started in 1821. During the Battle of Erzurum (1821), part of the Ottoman-Persian War (1821-1823), Mahmud II's superior force was routed by Abbas Mirza, resulting in a Qajar Persian victory which got confirmed in the Treaties of Erzurum. Several years later, in 1827, the combined British, French and Russian navies defeated the Ottoman Navy at the Battle of Navarino; in the aftermath, the Ottoman Empire was forced to recognize Greece with the Treaty of Constantinople in July 1832. This event, together with the French conquest of Algeria, an Ottoman province (see Ottoman Algeria) in 1830, marked the beginning of the gradual break-up of the Ottoman Empire. Non-Turkish ethnic groups living in the empire's territories, especially in Europe, started their own independence movements. One of Mahmud II's most notable acts during his reign was the destruction of the Janissary corps in June 1826. He accomplished this with careful calculation using his recently reformed wing of the military intended to replace the Janissaries. When the Janissaries mounted a demonstration against Mahmud II's proposed military reforms, he had their barracks fired upon effectively crushing the formerly elite Ottoman troops and burned the Belgrade forest outside Istanbul to incinerate any remnants. [full citation needed] This permitted the establishment of a European-style conscript army, recruited mainly from Turkish speakers of Rumelia and Asia Minor. Mahmud was also responsible for the subjugation of the Iraqi Mamluks by Ali Ridha Pasha in 1831. He ordered the execution of the renowned Ali Pasha of Tepelena. He sent his Grand Vizier to execute the Bosniak hero Husein Gradaščević and dissolve the Bosnia Eyalet. In 1839, just prior to his death, he began preparations for the Tanzimat reform era which included introducing a Council of Ministers or the Meclis-i Vukela. 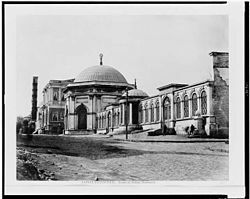 :49 The Tanzimat marked the beginning of modernization in Turkey and had immediate effects on social and legal aspects of life in the Empire, such as European style clothing, architecture, legislation, institutional organization, and land reform. He was also concerned for aspects of tradition. He made great efforts to revive the sport of archery. He ordered archery master Mustafa Kani to write a book about the history, construction, and use of Turkish bows, from which comes most of what is now known of Turkish archery. Mahmud II died of tuberculosis, in 1839. His funeral was attended by crowds of people who came to bid the Sultan farewell. His son Abdülmecid succeeded him and would continue to implement Tanzimat reform efforts. In his time the financial situation of the Empire was troubling, and certain social classes had long been under the oppression of heavy taxes. In dealing with the complicated questions that therefore arose, Mahmud II is considered to have demonstrated the best spirit of the best of the Köprülüs. A Firman of February 22, 1834, abolished the vexatious charges which public functionaries, when traversing the provinces, had long been accustomed to take from the inhabitants. By the same edict all collection of money, except for the two regular half-yearly periods, was denounced as abuses. "No one is ignorant," said Sultan Mahmud II in this document, "that I am bound to afford support to all my subjects against vexatious proceedings; to endeavour unceasingly to lighten, instead of increasing their burdens, and to ensure peace and tranquility. Therefore, those acts of oppression are at once contrary to the will of God, and to my imperial orders." The haraç, or capitation-tax, though moderate and exempting those who paid it from military service, had long been made an engine of gross tyranny through the insolence and misconduct of the government collectors. The Firman of 1834 abolished the old mode of levying it and ordained that it should be raised by a commission composed of the Kadı, the Muslim governors, and the Ayans, or municipal chiefs of Rayas in each district. Many other financial improvements were affected. By another important series of measures, the administrative government was simplified and strengthened, and a large number of sinecure offices were abolished. Sultan Mahmud II provided a valuable personal example of good sense, and economy, organising the imperial household, suppressing all titles without duties, and all salaried officials without functions. Mahmud II dealt effectively with the military fiefs, the "Tımar"s, and the "Ziamet"s. These had been instituted to furnish the old effective military force, but had long ceased to serve this purpose. By attaching them to the public domains, Mahmud II materially strengthened the resources of the state, and put an end to a host of corruptions. One of the most resolute acts of his ruling was the suppression of the Dere Beys, the hereditary local chiefs (with power to nominate their successors in default of male heirs), which, in one of the worst abuses of the Ottoman feudal system, had made themselves petty princes in almost every province of the empire. The reduction of these insubordinate feudatories was not affected at once, or without severe struggles and frequent rebellions. Mahmud II steadily persevered in this great measure and ultimately the island of Cyprus became the only part of the empire in which power that was not emanating from the Sultan was allowed to be retained by Dere Beys. Clothing was also an essential aspect of Mahmud II's reforms. He began by officially adopting the fez for the military after the Janissary eradication in 1826, which signified a break from the old style of military dress. On top of this, he ordered civilian officials to also adopt a similar, but plain, fez to distinguish them from the military. He planned for the population to adopt this as well, as he desired a homogeneous look for Ottoman society with an 1829 regulatory law. Unlike past Sultanic clothing decrees and those of other societies, Mahmud II wanted all levels of government and civilians to look the same. He faced significant resistance to these measures specifically from religious groups, laborers, and military members because of traditional, religious, and practical reasons. Mahmud II's portraits also give a valuable insight into his clothing mentality, as he switched to a more European-style and fez after 1826. On top of these reforms, Mahmud II was also critical in the establishment and flourishing of an Ottoman foreign affairs office. 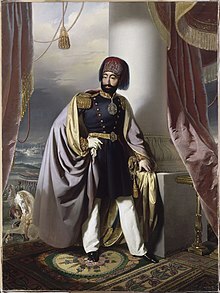 While he built upon Selim III's foundational elements of international diplomacy, Mahmud II was the first to create the title of Foreign Minister and Undersecretary in 1836. He placed enormous importance on this position and equated salary and rank with the highest military and civilian positions. Mahmud II also expanded the Language Office and Translation Office, and by 1833 it began to grow in both size and importance. After the reorganization of these offices, he also resumed Selim's efforts to create a system of permanent diplomatic representation in Europe. In 1834, permanent European embassies were established with the first in Paris. Despite the difficulties that came along with these actions, the expansion of diplomacy increased the transmission of ideas that would have a revolutionary effect on the development of bureaucracy and Ottoman society as a whole. 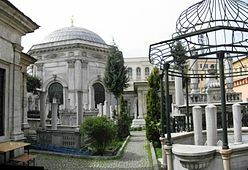 Hayriye Sultan (12 January 1832 – 15 February 1833, buried in Nakşidil Sultan Mausoleum, Fatih Mosque, Istanbul). The 1989 film Intimate Power, also known as The Favorite, is adapted from a historical fiction novel by Prince Michael of Greece. It portrays a legend about Aimée du Buc de Rivéry as a young captured French girl who, after spending years in an Ottoman harem, outlives two Sultans and protects Mahmud as his surrogate mother. Mahmud is a minor role in the film but is portrayed as both an adult and a child. The film concludes with a variation of his dramatic succession. ^ a b c Eugene Rogan (4 October 2002). Outside In: Marginality in the Modern Middle East. I.B.Tauris. p. 15. ISBN 978-1-86064-698-0. ^ Karpat, H. Kemal (1959). Turkey's Politics: The Transition to a Multi-Party System. Princeton University Press. ISBN 978-0-691-62623-9. ^ A History of the Modern Middle East Cleveland, William L. & Burton, Martin; Fifth Edition; Westview Press; USA; 2015, p. 71. ISBN 978-0813348339. ^ Davis, Claire (1970). The Palace of Topkapi in Istanbul. New York: Charles Scribner's Sons. pp. 214–217. ASIN B000NP64Z2. ^ Dr. Abdullah Mohammad Sindi. "The Direct Instruments of Western Control over the Arabs: The Shining Example of the House of Saud" (PDF). Social sciences and humanities. Retrieved 4 June 2012. ^ George Childs Kohn (2013). Dictionary of Wars. Routledge. p. 506 ff. ISBN 1135954941. ^ Engelhardt, Ed. (1882). La Turquie et le Tanzimat. Paris. p. 11. ^ Shaw, Stanford J.; Shaw, Ezel Kural (1977). History of the Ottoman Empire and modern Turkey Shaw. 2. Cambridge University Press. ISBN 9780521291668. ^ Koçu. Türk Giyim,. pp. 113–114. ^ a b Quataert, D. (1997). "Clothing Laws, State, and Society in the Ottoman Empire". International Journal of Middle East Studies. 29(3): 413. ^ Slade, Adolphus (1854). Records of travel in Turkey, Greece, etc. London. p. 194. ^ Demiral, II, Ömer (1989). Mahmud dönemide Sivas’ta esnaf teşkilâtı ve üretim-tüketim ilişkileri. Ankara. p. 81. ^ Sturmer (30 November 1836). 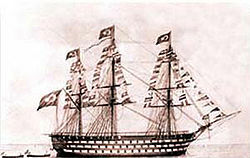 "HHS Turkei". Sturmer's no. 206A-B. v1/65. ^ a b Findley, C. "The Foundation of the Ottoman Foreign Ministry". International Journal of Middle East Studies. 3(4): 405. ^ Beydilli, Kemal; Süleyman, Mehmed Bin (2001). Bir imamın günlüğü. Tarih ve Tabiat Vakfı. p. 234. ^ Şehsuvaroğlu, Haluk Y. (2005). Asırlar boyunca İstanbul: Eserleri, Olayları, Kültürü. Yenigün Haber Ajansı. pp. 179, 263. ^ a b Uluçay 1992, p. 123. ^ M S: Milli saraylar, tarih kültür sanat mimarlık, Issue 6. TBMM Milli Saraylar Daire Başkanlığı Yayını. 2010. p. 20. ^ Uluçay 1992, p. 121. ^ a b Uluçay 1992, p. 120. ^ Kaya, Bayram Ali; Küçük, Sezai (2011). Defter-i Dervişan (Yenikapı Mevlevihanesi Günlükleri). Zeytinburnu Belediyesi. p. 347. ISBN 978-9-757-32133-0. ^ Madeline Zilfi, Women and Slavery in the Late Ottoman Empire: The Design of Difference, (Cambridge University Press, 2010), 227. ^ Rıza Balıkhane Nazırı, Ali; Çoruk, Ali Şükrü (2001). Eski zamanlarda İstanbul hayatı - Book 15. Kitabevi. p. 301. ISBN 978-9-757-32133-0. ^ a b Uluçay 1992, p. 126. ^ a b Uluçay 1992, p. 127. ^ The Concubine, the Princess, and the Teacher: Voices from the Ottoman Harem, transl. Douglas Scott Brookes, (University of Texas Press, 2008), 288. ^ Akyıldız, Ali (2016). Müsrif, Fakat Hayırsever: Pertevniyal Valide Sultan. p. 343. ^ Uluçay 1992, p. 124. ^ Hochhut, Pia. The Pious Foundation of Pertev Niyal - Remarks on the Steam Mills at Paşa Limanı (Üsküdar). ^ a b c Uluçay 1992, p. 128. ^ Madeline Zilfi, Women and Slavery in the Late Ottoman Empire: The Design of Difference, 227. ^ The Concubine, the Princess, and the Teacher: Voices from the Ottoman Harem, transl. Douglas Scott Brookes, 288. ^ a b c d Uluçay 1992, p. 134. ^ Uluçay 1992, p. 129. ^ Uluçay 1992, p. 130-1. ^ Uluçay 1992, p. 132. ^ a b c d Uluçay 1992, p. 133. ^ a b Uluçay 1992, p. 135. ^ Uluçay 1992, p. 135-8. ^ a b Uluçay 1992, p. 138.